Super charming standing Hare. Measures 1 1/2" tall. 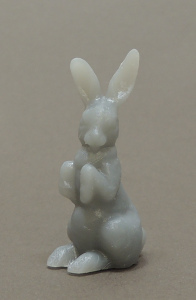 Beautifully finished, high resolution 3D print from our new resin printer. Ready to paint. So new I have not had a chance to paint a sample yet, but I'm sure you can see that he has tons of detail and personality!